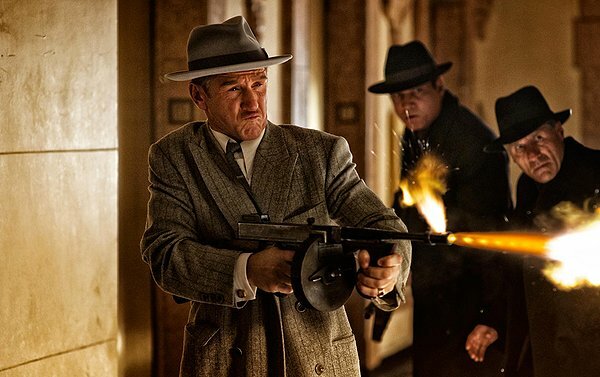 Gangster Squad was originally going to be dumped in September of last year, but then the Aurora shootings occurred and a whole scene involving a movie theater massacre had to be taken out, reshoots were ordered, and the movie was pushed to January, the worst of movie wasteland months. Still, Gangster Squad looked like it might be good or even close to great, with all these great actors and a combination Untouchables/L.A. Confidential vibe. This movie is not very close to either of those classics. Coming courtesy of Ruben Fleischer, who gave us the fun Zombieland and the awful 30 Minutes or Less, I can’t think of a more mismatched director for these actors that doesn’t qualify as a joke. The movie starts off darkly comic, then Ryan Gosling opens his mouth and you think, “This might be a comedy. I think this is a comedy.” But much to your disappointment you’ll find out that this isn’t a comedy at all and it really is this bad. 40’s/50’s L.A. gang fixture Mickey Cohen (Sean Penn) is doing his mobster thing when Police Chief Parker (Nick Nolte) decides he’s had enough and taps hard-boiled Sgt. John O’Mara (Josh Brolin) to form a no-rules team of lawmen to go to war with Cohen. O’Mara brings in Sgt. Jerry Wooters (Gosling), and officers Coleman Harris (Anthony Mackie), Max Kennard (Robert Patrick), and Conway Keeler (Giovanni Ribisi) into this team. And as an afterthought in the story and the movie, Navidad Ramirez (Michael Pena) rounds out the squad. They basically have to take justice in their own hands, going where they know the illegal activity is happening and start cracking heads, and then hopefully take Mickey down in a hail of bullets or in handcuffs by movie’s end. The movie has a real problem with character. In The Untouchables, which this movie definitely thinks it’s trying to be, we see Eliot Ness (Kevin Costner) suffer a defeat in the early going in trying to do the right thing because warrants just mean dirty cops tip off the gangsters. We feel for his character as he’s ribbed mercilessly at the police station. Then he picks up Sean Connery, who is awesome, and just-out-of-the-academy Andy Garcia. You got a numbers guy played by Charles Martin Smith. All of them are memorable in one way or another, and De Niro’s Capone is frightening. Here, Ryan Gosling’s character is that he apparently likes to bang Emma Stone, which was the exact same thing that he did in Crazy Stupid Love. Robert Patrick is supposed to be Connery’s character, but they don’t give him much to do. Michael Pena is a really fun actor but I think he’s in this for 5 minutes, swept under the rug, and given the most incredibly Latino name ever in a feature film: Navidad Ramirez? Seriously? Really the only person out of this squad that acquits himself nicely is Ribisi, who is the “smart” one in the group and is given one decent scene. Which brings us to Sean Penn, who is in a thankless, one-note mob boss role. Everything he says is accompanied by wild hand gestures and under prosthetics and makeup, is pretty much a cartoon. I’m sure he was told to play it like this, but the filmmakers can’t have it both ways. Either Mickey is a man you should fear, or he’s a guy who’s hunting wabbits. By the way, the ending, which had to get re-shot, is basically, “Let’s do what The Untouchables did.” It has already failed so hard at being that movie to this point, you just kind of shrug and just hope it doesn’t take too long.